We print and deliver 1000s of orders throughout the UK and beyond. Most of our printed products take 5-7 working days to reach you. Products that require specialist finishing such a metallic foiling and raised print, can take between 7-9 working days. We will print your order in 3-5 working days starting from the next working day after you approve your proof. Orders placed using one of our designs do not require approval and will be printed in 3-5 working days starting from the next working day after you place your order. Delivery generally takes upto 3 working days, however please allow for a few extra days in case of unexpected delays. For a small additional charge you can have your product delivered the next working day once it has been printed. You will also have the added security that your item will have to be signed for. 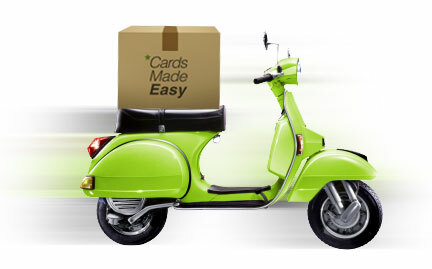 If you need your cards in a hurry, Cards Made Easy offer an express service to all customers. Express Service is either an Express Courier or Express Collection, both of which can be selected at the checkout page. Express Orders will be processed ASAP and providing you approve the proof without delay will be despatched (or ready for collection) within 1 working day. This can be the same day for standard orders approved before 11am. It is not possible to extend the express service to more complicated cards such as those with Raised Ink etc. If you require more information or need a quote for Saturday delivery then please contact us via email or on 020 7566 5090.